You are here: Home / Culture / Buildings / For Sale: One Gently Used Iconic Power Station – Knock Down Price of £500 Million! For Sale: One Gently Used Iconic Power Station – Knock Down Price of £500 Million! If you’re in the market for a new pad in London – we’ve got the perfect place for you! 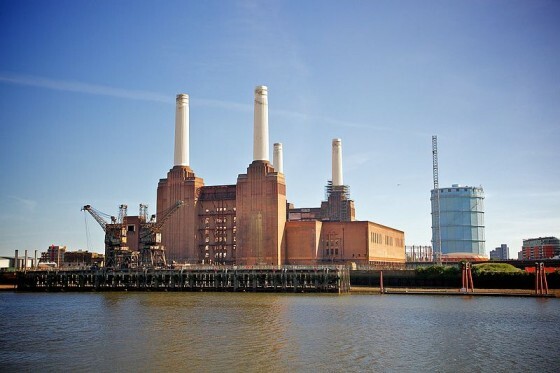 Battersea Power Station is on the market again. The building, made famous by the Pink Floyd album cover, has gone through a string of owners and grand plans to redevelop the site since it was decommissioned back int he 1980’s. All grand plans have gone no where – it’s the last huge area in central London dying to be redeveloped but no one can seem to make it happen. And, it’s now been put on the market again by the company charged with disposing of Ireland’s assets (it’s complicated but basically an Irish company bought the site and then went bust). You’ll spend a fortune – renovating the site and making it useful will cost £5 Billion + – but you’ll have the satisfaction of doing the place up yourself. It’s for sale at the bargain basement price of £500 Million! Source – The Evening Standard.